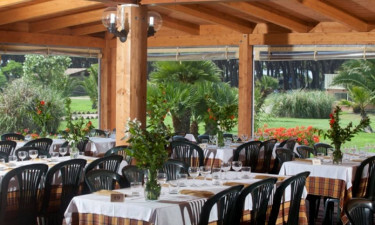 California Camping Village, the fabulous luxury camping site, is in an exclusive seaside resort in the luscious Italian Maremma. It is next to a beautiful pine forest, has amazing panoramic views, and offers all the amenities and in-house entertainment that families, or anyone else that loves camping luxury, would enjoy. For more exciting information please ask Lux-Camp. Why Should I Camp in Camping California? There is a great choice of accommodation, including a bungalow tent, a luxury tent, or a mobile home. There is a spa, lagoon-type swimming pool, a children's pool, a gym, basketball, football, tennis, table tennis, archery, a fun junior club, evening shows, aerobics, dance classes, and a wealth of activities organised by the holiday camping site entertainment staff. You can also go on the sea in a canoe or pedalos. In the evening you can enjoy karaoke, cabaret, films, dancing, and themed events. 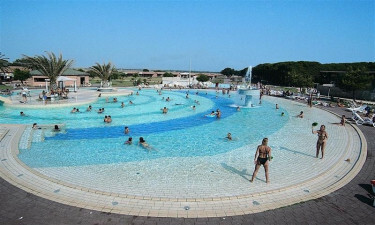 From the holiday camping site, you are in easy reach of the Fiora river, as well as the Archaeologcal Park of Vulci, the Aquatrek, the volcanic Lamone Nature Reserve, the Oasis of Burano, the Spanish Tower, and the town of Pitigliano, which is built on steep rocks, and was once an ancient Roman settlement. This camping holiday offers all that you need: there is a supermarket, an enticing restaurant, a pizzaria, snack outlets, and an information desk; and the local area has bars, restaurants, and unique shops.